Client Spotlight: Super Micro Computer, Inc. at SuperComputing 2017 | Absolute Exhibits, Inc. The annual SuperComputing (SC) conference is led by organizations in green energy, artificial intelligence, machine learning, aerospace, advanced manufacturing and other industries that rely on high performance computing. SC attracts a diverse crowd ranging from researchers to scientists and application developers to computing industry staff making it the go-to event for technical computing professionals. This year’s SC17 was the largest in the show’s history with 155,000 net square feet of exhibition space and 350 exhibitors, including 46 first-time exhibitors and 111 organizations, from a total of 26 countries outside of the United States. 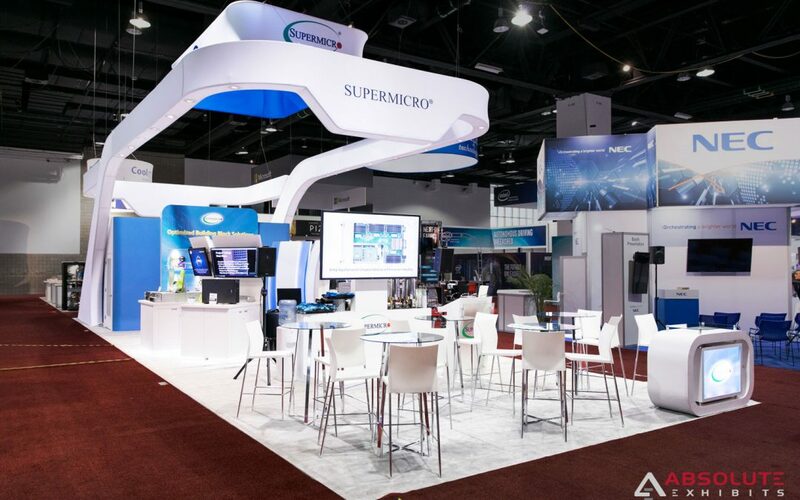 In preparation for SC17, Super Micro Computer, Inc. partnered with Absolute Exhibits for a custom 20×60-foot rental exhibit. Super Micro Computer, Inc. is a global leader in high performance, high efficiency server technology and innovation for various markets, including data centers, cloud computing, enterprise IT and big data. As technology experts, the company desired a modern, tech-inspired exhibit that would position them as authorities in their industry. Super Micro Computer, Inc. also sought to showcase and present on a variety of its products, including several motherboards and servers. During the planning phase, we determined with Super Micro Computer, Inc. that the booth would require two (2) private meeting rooms, one (1) large storage room, reception area, six (6) oversized workstations and a presentation area with seating for 15-20 people. The biggest challenge lie in designing a space that could properly accommodate all of these booth requirements without making the booth feel cluttered or unorganized. After several meetings with the client to discuss ideas and review sketches, our teams were able to design a layout that used the booth space efficiently, maintained a clean and organized appearance and helped the booth feel open and spacious. Each of the six (6) curved workstations featured a 46” monitor and block base to display and store products. The presentation area included four (4) bar height tables each with four (4) chairs and a backlit counter with glass top and locking storage in the adjacent reception area. Overhead hung a large hanging sign with printed exterior and interior, as well as an even larger fabric header structure with recessed lighting – a first for Absolute Exhibits. SC17 was a huge success for Super Micro Computer, Inc. The company was also featured by several publications, including interviews by HPCwire and InsideHPC. “Absolute Exhibits was very easy and flexible to work with,” said Desiree Marx, Event Program Manager for Super Micro Computer, Inc.
“We had a lot of changes, many of which were last minute, and Kyle, Michael and the team were willing and able to roll with it even when I was ready to pull my hair out! The booth turned out great! For more information about this project or to receive a quote for a trade show exhibit rental, please contact Kyle Moeller at (714) 685-2851 or email kmoeller(at)absoluteexhibits.com.